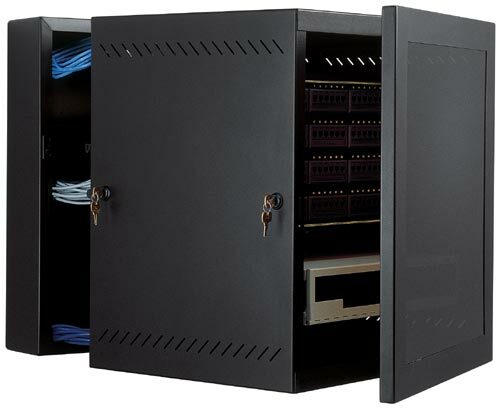 Wallit™ Swing-Out GP racks provide 19" rack-mounting capability on a swinging frame within a distribution enclosure that is designed to be mounted to the wall. Wallit™ Swing-Out GP enclosure features a center swing-out section (up to 18-inches deep) that gets closed off with a front locking Plexiglas door (or an optional solid door). Front and rear sections lock independently for added security. Equipped with ventilation slots on the cabinet's sides, the fully welded Wallit™ Swing-out GP enclosure is constructed of heavy-duty 14-gauge steel, and features a reversible mounting design, making left or right hand swing-out possible. The swing-out frame consist of two sets of pre-tapped #12-24, 11 gauge steel, 19" rack-mount vertical mounting rails (with an adjustable depth positioning in ½" increments), in which optional shelves and accessories may be positioned at any desired height.